The South Side Community Art Center is located in a beautiful 1893 Georgian Revival house, the former home of a wealthy grain merchant. Its galleries and the row of arched windows in its third-story ballroom overlook a calm stretch of South Michigan Avenue in Bronzeville. SSCAC’s collections include federally commissioned art from the 1940s, works from the Black Arts Movement and the AfriCOBRA collective of the 1960s, as well as pieces by present-day artists. The South Side Community Art Center turns seventy-five this upcoming December. In preparation, the Center will host a number of fundraisers this year, including a reproduction of the famed Artists and Models Ball held to raise money in 1939. While some of the building’s upstairs rooms, including the ballroom, are in rough shape, plans for this year also include moving forward with plans to renovate the mansion to its original grandeur. SSCAC board member and University of Chicago art history professor Rebecca Zorach is leading a new initiative to digitize the center’s historic records and works—I’m one of the assistants working on that project. In August 2014 Maséqua Myers became SSCAC’s new executive director. 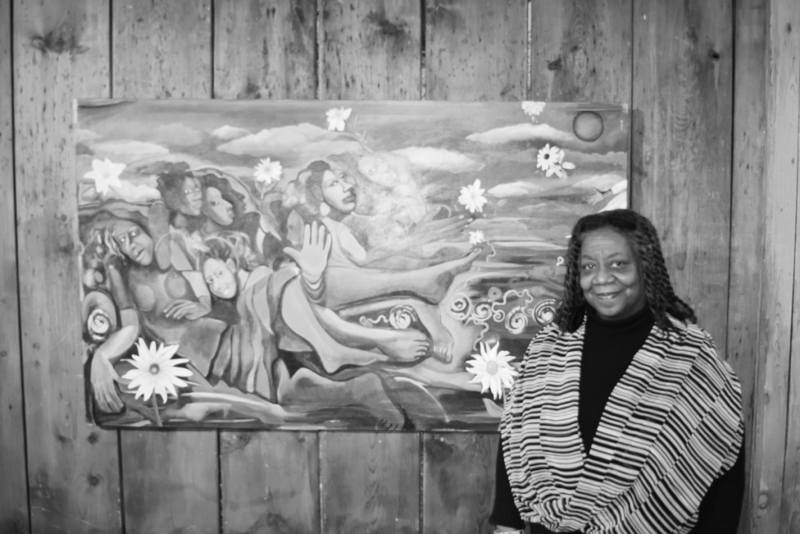 She’s a registered nurse, but has always been involved in the arts as multidisciplinary artist with projects as diverse as filmmaking, media consulting, and producing the Teen Talk Radio Theater program on WHPK 88.5FM. I sat down with Myers in her bright second-story office at SSCAC to talk about the Center’s storied past and where it’s going from here. The South Side Community Art Center was created because of a lack of opportunities for African-American artists to display their works. In the 1930s, Peter Pollack was a Jewish gallerist in downtown Chicago. He was instrumental in founding SSCAC because he was the only one who would display African-American art. He was an officer with the WPA Federal Art Project, and he championed the cause of the SSCAC and led to it being one of the recipients of that federal funding. Before that, African-American artists exhibited their art, but not in established galleries. Art was displayed in churches, YMCAs, or any place where the public could gather to appreciate art. Dr. Margaret Burroughs, one of the hardest-working, longest-living founders of the organization, worked tirelessly to raise the $8,000 that it took to buy this building. She had the Trail of Dimes, like what a lot of people still do. They went to certain corners of our city with that little cup and give the spiel about who they are. That’s primarily how the monies were raised to buy this building. We are the first African-American art center in the nation and the only art center out of the 110 [WPA-FAP art centers] that is still operational. In May 1941, Eleanor Roosevelt gave the dedication speech in what is now called the Burroughs Gallery on the ground floor. When she spoke, the streets were filled with people, from 37th Street all the way down to 39th Street. Thousands of people wanted to be as close as they could to such a historic moment. Before the Depression, Michigan Avenue was lined up and down both sides of the street with mansions, but it became difficult to keep up those homes. The home had been vacant about fifteen years before SSCAC acquired it and was in need of remodeling. How does SSCAC affect the community around it? Art brings vitality. It gives us an opportunity to express ourselves in creative ways—people get a chance to view something as safe as the way someone paints a flower or a building, or the reality of how they’re living. Art also fosters communication and healing. As a result of that, there was a vibrancy that this particular magic art center brought to the neighborhood. I’ve heard stories from elders in their eighties who were young when the Center was founded. They would stand outside, they say, and look at all of the energy from the people who came into this building and they would say, “One day I’ll be old enough to go in there.” That gives you an idea of the spirit and the vitality and opportunity that this center created at that time, and still does. SSCAC is doing something different. It’s not just an art center, but also a center for social change. We don’t see a separation between the two. This center becomes like a town hall meeting-place, so people can come in and talk about social issues of the day, and how to address them as a community member or as an artist. That’s something that sets us apart from other art centers and galleries: we don’t just have art for art’s sake, but we also have art for education and social change. I believe one of the reasons SSCAC is still here is because it’s filled a void for the African-American community—it provides a place where African Americans can display their art. There are so many more galleries now that are accepting and welcoming of African-American art than there were in the 1940s, but no one else has the specific mission that we have: we conserve, preserve, and promote the legacy and the future of this art while we educate the community of the value of this art and culture. Has the Center ever run across hard times? Yes! As a matter of fact, we’re probably in one right now. A lot of it has to do with where the country is at the time. We’re a nonprofit and rely on donations and art sales. If the country’s not flourishing economically, that’s going to affect us. Grants can be an iffy situation too. We’ve had some highs and some lows, but obviously the lows have not been low enough, I’m proud to say! How do you select artists and plan exhibitions? We have artists that are always seeking us out because of our name and community presence, but we also like to seek out artists that we find are saying something. We want to stay relevant to the times, but that doesn’t mean all the art has to be contemporary. It means we want to affect life and improve it. So if someone is trying to express themselves, then we like that. It doesn’t mean we won’t accept flowers or landscapes, but we’re open-minded and will take paintings that depict issues like gun violence or discrimination, whereas other galleries may not want to do that. Has SSCAC organized any special programming in the last year in response to national issues of police violence? One of our biggest projects in the last year was called “Paint the Block.” It was an event where we partnered artists with a younger person from the community. We had these wonderful large pieces of plywood and everyone from the community would come, dip into paint, and express themselves. It didn’t matter if you were an artist or just someone who wanted to participate and engage. Then the artist would take everything and tie it together with their talents. It allows people in the community to see that there are other ways to express yourself than in a violent manner. Let’s talk about the future of SSCAC. Do you have a particular vision or things you’d like to see happen? I’d like to see us educate the city and country at large about the value of African-American art. Another vision would be to continue SSCAC’s role as a place to educate young people in the arts, to continue having multidisciplinary classes and to be a premier place to develop emerging artists. Do you have a favorite story or person from SSCAC’s history? Well, Dr. Burroughs is a given. I actually met her when I was a teen. I took and observed classes here, with OBAC [Organization of Black American Culture], which was a quite respected poetry group in Chicago in the 1960s and 1970s that held their meetings here, and Kuumba workshop, which had African dance classes here. And Dr. Burroughs was my Humanities 101 instructor at Kennedy-King College. I’ve had a direct experience of her ability to invigorate you, to make you feel very good about who you are and the importance of your culture as an African American. And I’ve learned from her that you don’t need to dislike anyone else to love yourself—as a matter of fact, it’s counter-productive. There’s also Gordon Parks [a photographer who had a darkroom in the basement]—my family grew up on Life magazine, and he was the first African-American photojournalist. I remember seeing his work and hearing older people talk about his works and how wonderful it was to have this black photojournalist shooting for Life magazine. And there was Gwendolyn Brooks, the first black poet laureate of Illinois. Some of her poems just hit home—”we real cool, we left school…” One of the stories I’ve heard is how she would sit at the west window of our gallery at the piano, and use that moment of watching the sun and write her poems. Sometimes I come in here, when no one’s here, and I believe I can feel her spirit filling the room.